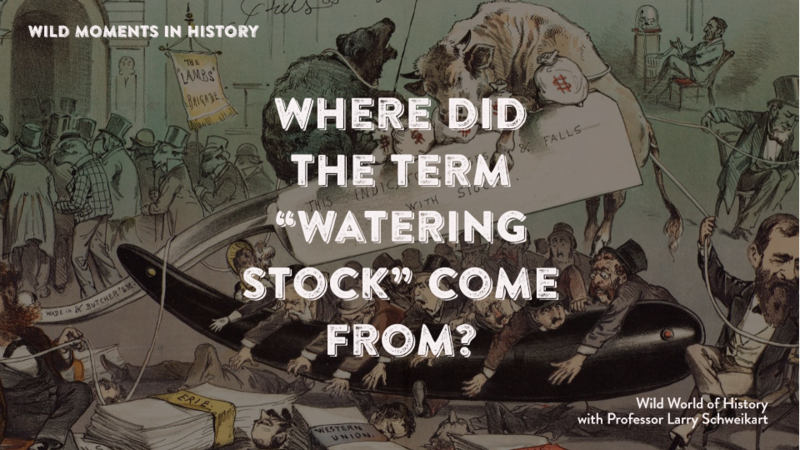 Did you know that “watering” stock did not refer, at first, to stock on the New York Stock Exchange but to cattle? Daniel Drew, a guy who came back from the dead more than Freddie Krueger, did not have an easy life, despite his early affluence on his father’s farm in New York. Relatively uneducated, even when he had money, Drew had to find his own work. He fought in the War of 1812, saw no combat, and returned home to work as a cattle drover. He purchased cattle in upstate New York and drove them to New York City butcher shops. Briefly, he interrupted his cattle enterprise to tour with a circus. He returned to buying and selling cattle, and opened an inn at the Bowery in New York, next to the stockyards where he kept his own cattle and rented space to other drivers. Drew’s cattle drives soon stretched to Pennsylvania and ultimately to Illinois, where his horse was struck by lightning. Drew abruptly shifted his interest to canals and steamboats. Before he did, however, he became famous for “watering” stock. As he would drive his herds to New York City, he would stop them before he got to the city and feed them salt, then, just before the sale, he would water his herds. This inflated the weight and value of his herd ... his stock. Hence, “watering” stock ... in this case his cattle stock. Later, the practice of printing more stock than a company had assets to back it came to be known as "watering stocks" ... but in this case it meant stocks of a company. Drew was involved in so many stock manipulations that his term “watering” became associated with excess printing of stock. Drew also became involved in the infamous “Harlem Corner,” where he, Jim Fisk, and Jay Gould tried to bribe New York City aldermen and even New York state legislators to rig the price of Harlem Railroad stock and found themselves aligned against Commodore Cornelius Vanderbilt. Nevertheless, Drew would join Fisk and Gould a second time to try another scam in the Erie War, and again, Vanderbilt beat them. For further reading, see Clifford Browder, The Money Game in Old New York.